Tag line: "You're traveling through another dimension. 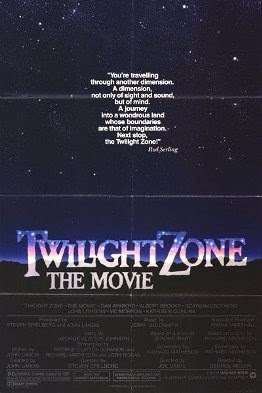 A dimension, not only of sight and sound, but of mind..."
Twilight Zone: The Movie, a 1983 anthology based on the popular television series from the ‘50s and ‘60s, will forever be marred by the tragedy that occurred during its production. On July 23, 1982, while shooting the John Landis-directed segment Time Out, actor Vic Morrow and two children were killed when a helicopter lost control (Morrow and one of the kids were decapitated by the rotor blade, while the second child was crushed to death by the falling copter). It was a disaster that should never have happened (in violation of child labor laws, the scene was being shot at 2:30 in the morning), and regardless of how many times I see it, I can’t watch the film without thinking of this terrible accident. Following a brief prologue (starring Albert Brooks and Dan Aykroyd), Twilight Zone: The Movie presents four tales of mystery and suspense, starting with the above-mentioned Time Out, in which Morrow plays William Conner, a Vietnam vet and unapologetic bigot who, while sitting with some co-workers in a bar after work, loudly complains about minorities, shouting a few racial slurs in the process. But before the night is out, the “Zone” will show Mr. Conner the error of his ways. The next segment, titled Kick the Can, was directed by Steven Spielberg, and concerns the residents of a retirement community who, following the arrival of newbie Mr. Bloom (Scatman Crothers), are reminded how it feels to be young. Joe Dante’s It’s a Good Life sees teacher Helen Foley (Kathleen Quinlan) make a trip to the home of young Anthony (Jeremy Licht), who, thanks to his special powers, always gets his way. Rounding out the group is George Miller’s Nightmare at 20,000 Feet, about an airline passenger (John Lithgow) whose fear of flying is taken to a whole new level. Each segment has its strengths, starting with the prologue, an often-funny opening scene (thanks to Brooks’ and Aykroyd’s snappy dialogue) with an unforgettable ending. Along with its message of tolerance, Time Out reminds us just how good Vic Morrow was at being bad. Having made a career out of playing bastards in movies like Blackboard Jungle, The Bad News Bears, and Humanoids from the Deep, Morrow continues his streak by portraying an extreme racist, one who gets his comeuppance when forced to experience life in both Nazi Germany (as a Jew) and the rural south (as a black man). Kick the Can is the film’s most light-hearted tale (you can’t help but like it), shining a light on the elderly, and how, more often than not, they’re overlooked by the younger generations. It’s a Good Life is the visually vibrant story of a boy who can make things happen just by thinking about them, an ability that scares the hell out of his relatives (Kevin McCarthy, of Invasion of the Body Snatchers fame, plays Anthony’s subservient Uncle Walt). It’s a creepy segment that, at times, gets under your skin, but when it comes to sheer terror, nothing can top Nightmare at 20,000 Feet. John Lithgow delivers a manic performance as the frightened passenger who, because of his hysteria, can’t convince anyone that there’s something sinister walking around on the plane’s wings. A taut, edgy tale about paranoia, Nightmare at 20,000 Feet will have you squirming on the edge of your seat. While it’s impossible to forget the tragedy that haunts the film to this day, there’s no denying that Twilight Zone: The Movie is a whole lot of fun to watch, with a quartet of tales that ultimately offer something for everyone. I always found the TZ film to be hollow and without emotion. Good review, Dave. The tragedy aside, I always felt that the Twilight Zone movie should have created a brand new set of stories, instead of essentially doing covers of classic tales (although Landis' is original). The opening scene with Brooks and Akroyd does such a good job of evoking the appeal and tone of the classic Zone, that I think audiences would have had an easy transition into new material, provided it had the same flavor. In fact, there are some terrific episodes of the 80's tv version of Twilight Zone--Nightcrawlers comes to mind--that would have excelled in this format. The 1988 movie Miracle Mile was supposed to be one of the focal pieces here, but when Spielberg came on, he wanted to brighten it up a bit, and ultimately it got cut. Again, that story, especially in 1983, would have likely made a bigger impression. That being said, I still have a warm spot in my heart for this movie; the second half of this thing was pure nightmare fuel for my little kid brain back in the 80s. Dante and Miller knock it out of the park, and to me their work eclipses the original versions. It's A Good Life was more of a vignette on the Serling show; here it has a life of it's own, a complete story with chilling implications and an amazing visual delivery. And Lithgow out-shatted Shatner in the paranoid ranting department in the final short. Strangely, it's Spielberg's piece that feels the most toothless to me. I wonder if we are ready for another modern stab at a legitimate Twilight Zone venture. I liked the 80's one, found interesting things about the lost Serling episodes they did in the 90s, but was extremely let down by the revamp with Forrest Whitaker (which, incidentally, did a pathetic sequel to It's A Good Life). The latest attempt is being described by CBS as a cross between a game and a movie. Not sure how excited I am about that. Until then, I guess we have Black Mirror.